Allows fast and secure transmission, visualization and findings of the medical images via networks in intranet or internet. Advanced and cost-effective teleradiology solution for radiological hospitals and practices. Important extra module for finding and viewing of neuroradiological DICOM-images by the telemedical collaboration of radiology, stroke unit and tele-stroke unit.. The tendency of development in radiology goes away from the film and paper based radiology to the integrated, electronically managed specialists department. To support radiology practices and to meet the requirements of the advanced medical communication and teleradiology, the VIMED® WEB-ENTRY provides an advanced technology with quick easy access to image data at an affordable price. 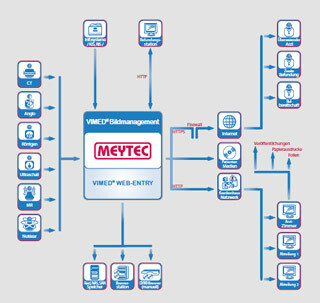 VIMED® WEB-ENTRY is an elaborate system for user management. It allows the contemplation of data exclusively for their own patients. A PC with Internet Explorer is the only requirement to view the images. The web-based VIMED® system provides the granting of the temporary access for medical colleagues for second opinion. All image data can be accessed via an encrypted internet connection. VIMED® supports the creation of data media in accordance with the DICOM-standard and the writing of offline CD‘s / DVD‘s with the Rimage Producer Station. The data media contains a viewer to display the DICOM-images that starts automatically after you‘ve inserted the CD/DVD disc. The images can also be contemplated on specific mobile devices while visiting patients.